A fully ecological and recycle project, made 90% with containers refurnished in local wood and sheep wool for a better insulation and experience. If you don't like surf, It still a must on the travelers adventure. We are the only hostel in the same Punta de Lobos, as it is a rural zone it does not have an exact address, just Camino Punta de Lobos 169. See the map below or contact info. Only a few nice houses, a lot of greens, quiet and great 360 degrees view of landscape and the surf spot. Just 5 km from Pichilemu downtown. We also work with volunteers, so if you are looking for a working surfing experience write us. 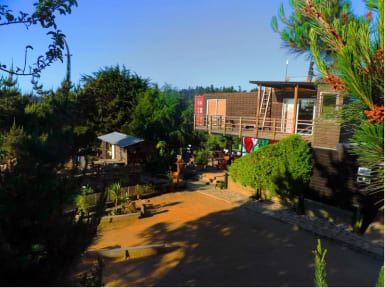 The hostel has TV, kitchen available, surf and wetsuit rental, surf lessons, barbeque area, a lot of green in and around, bike rental, the best vibes ever and fully designed for good sleeping, surfing and eating, plus enjoying meeting nice people and exchanging cultures. Also we have surfboard ding fixings, surf shop, trekking and cycling activities. Best surfing season is from September to May! we are very flexible with check in and check out times, all beds includes linen. We recommend you to bring your own towel, if not we have for rental.